Tom: What in god's name was EVS DOING! in Detroit to bring in the new year? Inspecting the tank plant? Eyeballing all the Rosie riveters -- including my mother -- working on bomber wings? (You did see the original Rosie passed in Lansing this Sunday past. )Seriously, any more specific ID of where that table sat? This is marvelous. They say to "expect the unexpected", but I never expected this. Ah yes, memory of "Better Days" (but here we are). . . . .
What EVS was doing in the Motor City on New Year's in wartime is a question worth pondering, as is the question of exactly where and why this picture was taken. EVS was a famous con artist. His real name was Erich Oswald Stroheim. He was the son of a middle-class Jewish hatmaker. But in Hollywood, where identity was always in the mind of the self-inventor, he passed himself off as Austrian nobility, adopting the name Count Erich Oswald Hans Carl Maria von Stroheim und Nordenwall. His agent, Paul Kohner, Billy Wilder (who directed him in Sunset Boulevard, 1950), and others remarked that he spoke German with a distinctive lower-class Austrian accent. But Jean Renoir -- who had directed him in La Grande Illusion (1937) and was working on another film with him in France when the Second War broke out and Stroheim fled back to the US -- went further and charged that Stroheim couldn't speak German at all and had to study like a schoolboy in order to fake-up his German lines. In Foolish Wives (1922, see lower photo) Stroheim "plays to character": his character is a phony count who adopts the name and title Count Wladislaw Sergius Karamzin in order to meet rich women and extort money from them (in particular those who are dumb enough to allow themselves to be seduced by him). Sooo... the dialogue at that dinner table in Detroit... would be interesting to speculate upon. Well, it IS interesting to speculate upon (as are the reasons for EVS's difficulties with German), but I must say that it's a wonderful picture -- akin to so many restaurant souvenir shots (I came across one of me and some work colleagues the other day that was taken in an old-style Las Vegas restaurant 20 years ago and we look nice and much younger, but so very stiff), but imbued with more presence and artistic personality. The restaurant looks lovely, the woman is beautiful, I think, and EVS looks great. Detroit, I'm assuming, was really hopping in early 1942. Yes, the old time social restaurant life. 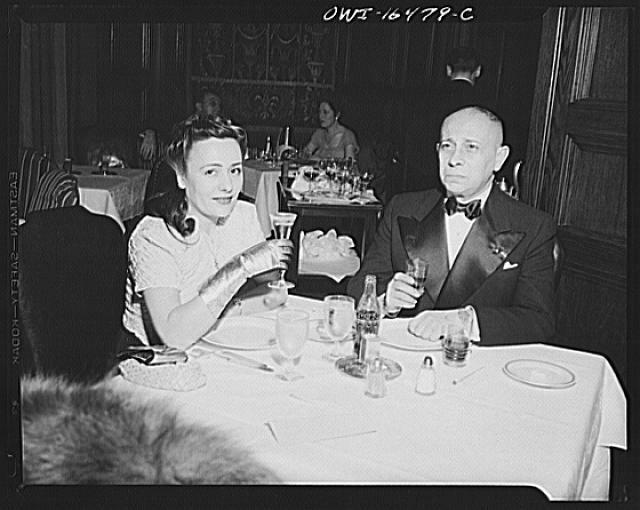 I once wrote a book on Damon Runyon, who in his later days spent, it seems, about 80 percent of his New York City life at Lindy's, ten percent at the Stork Club and ten percent, at most, at home. But I'm still thinking about EVS, to whom I have perhaps not given due credit for his unique genius. I've just been looking again at Foolish Wives, which is remarkable indeed. The muddy frontiers between aristo manners and underground squalor, between the world of the depraved and deprived and the world of the rich and terminally dippy, are investigated with wonderful bravado by von Stroheim. The film is beautiful to look at, but the phony count's cloud castles in the sky keep springing leaks. One might have a laugh. Von Stroheim's Foolish Wives, 1922 (Part 1 of 15). And by the by, this one-minute clip from the film, in which, without a doubt, Erich von Stroheim is Smokin', must rate in the top five cinematic cigarette moments of all time. They don't puff 'em like that anymore. Lindy's cheese cake IS the best! heck every-one of them "the real deal"
Stone Girl yet eats there.... so to speak! Thanks for further Good News on smokin' von Stroheim -- and the link to those fine Foolish Wives. . . . Maybe they were saying "around midnight" (as Heidegger said last night) "the sun has still not come up"? So far the new year here is shaping up pretty much the way it seems to be appearing to the fraudulent count, in the photo. Sick cats and humans all about, shivering and gasping. "the sun has still not come up"